Sheet metal screw #6 x 3/8" long phillips pan head. #6 Truss head zinc plated machine screw 1/2 inch long. 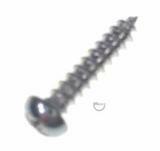 Sheet metal screw - Phillips flat head, Zinc plated steel, #6 x 1/2 inch long.